The Northrop N-9M was a one-third scale aircraft used for the development of the Northrop XB-35 and YB-35 Flying Wing long-range bomber program. First flown in 1942, the N-9M (M for Model) was the third in a lineage of all-wing Northrop aircraft designs that began in 1929 when Jack Northrop succeeded in early experiments with his single-prop, twin-tailed, stressed metal skin "Flying Wing" monoplane, and a decade later, the dual-prop N-1M of 1939-1941. Northrop's pioneering all-wing aircraft would lead Northrop-Grumman many years later to eventually develop the advanced B-2 Spirit stealth bomber, which debuted in Air Force inventory in 1989. On 30 October 1941, the preliminary order for development of the B-35 Flying Wing bomber was confirmed, including engineering, testing, and - most importantly - a 60ft (18m) wingspan, one-third scale aircraft, designated N-9M. It was to be used in gathering data on flight performance and for familiarizing pilots with the program's radical, all-wing design. The first N-9M was ordered in the original contract, but this was later expanded to three test aircraft in early 1943. A fourth was ordered a few months later and would incorporate flight test improvements, including different, more powerful engines. They were designated N-9M-1, -2, -A, and -B, respectively. The N-9M framework was partially constructed of wood to reduce its overall weight. The wings' outer surfaces were also skinned in a strong laminated plywood. The central section (roughly equivalent to the fuselage) was made of tubular steel. The aircraft was powered by two Menasco C65-1 engines, driving twin-bladed propellers. The original engines were 290hp (216); the N-9MB later upgraded to 400hp (298kW) Franklin engines. The first flight of the N-9M occurred on 27 December 1942 with Northrop test pilot John Myers at the controls. During the next five months, 45 flights were made. Nearly all were terminated by mechanical failures of one sort or another, the Menasco engines being the primary source of those problems. After roughly 22.5 hours of accumulated flight time, the first N-9M crashed approximately 12miles (19km) west of Muroc Army Air Base on 19 May 1943. The pilot, Max Constant, was killed as he attempted to recover the aircraft from a right-hand, 60� nose-down spin. The investigation found that Constant had suffered control reversal, the control column had been pressed against his chest during his recovery attempt from the steep spin, preventing him for parachuting to safety. Steps were taken to fix this problem and prevent it from happening on other N-9M test aircraft. When Northrop's Flying Wing bomber program was canceled, all remaining N-9M flight test aircraft, except for the final N-9MB, were scrapped. For more than three decades, it slowly deteriorated until the Chino, California Planes of Fame Air Museum acquired the aircraft in 1982 and began the labor intensive restoration process. For the next two decades, former Northrop employees and other skilled volunteers, slowly returned the N-9MB to last flight configuation. 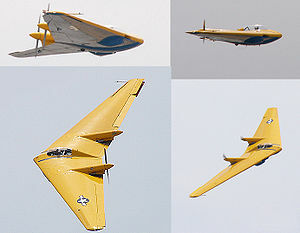 Since 2001, the yellow-and-blue Flying Wing has been exhibited, with flight demonstrations at several airshows every year. In April 2006, the N-9MB suffered an in-flight engine fire. The aircraft was landed safely with limited damage. Donations to the museum were solicited for its repair, and the aircraft was fully repaired to flight status. It was once again flown during the annual Chino airshow on 15-16 May 2010. Picture - The restored N-9MB Flying Wing being flown at Planes of Fame's 2004 airshow, Chino. The museum usually flies their one-of-a-kind Flying Wing at several airshows per year. Donald, David, editor. "Northrop Flying Wings", Encyclopedia of World Aircraft. Etobicoke, Ontario: Prospero Books, 1997. ISBN 1-85605-375-X. O'Leary, Michael. "Northrop's Flying Sorcery". Aeroplane, Volume 35, Number 6, Issue 410, June 2007. pp.62-64. O'Leary, Michael. "The Shape of Wings to Come". Aeroplane, Volume 35, Number 6, Issue 410, June 2007, pp.65-68.